New trend at green music festivals. More than 40,000 Phishheads arrived at the foot of southern California’s Little San Bernardino Mountains for a 3-day music festival last October. At night, the crowd gathered by the stage. By day, Frisbees soared and on cook stoves people prepared, well, not your typical camping fare. There were farm-fresh eggs for breakfast and for dinner burritos brimming with locally grown produce. Between meals, campers ate California-grown oranges and persimmons. The mostly organic food came from the large farmers’ market in the center of the festival: 14 vendors sold everything from strawberries to coffee, most of which came from within 100 miles of the concert site in Indio. While Phish is unofficially considered a pioneer in “green” concerts, the marriage of music festivals and farmers’ markets isn’t unique to them. The concept is, in fact, spreading across the country. 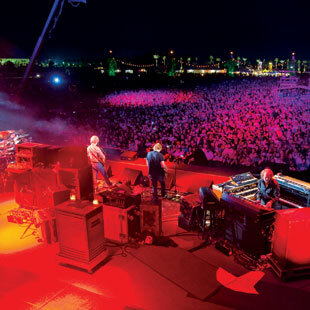 Manchester, Tennessee’s Bonnaroo in June is the modern granddaddy of music festivals with a musically diverse lineup (from Dave Matthews to rapper Jay-Z) and over 75,000 attendees. Among its many stages was a Victory Garden—two vegetable beds, two herb beds and a demonstration compost pile—where workshops were held on various gardening topics. Other music festivals are featuring farmers’ markets this year, too: Coachella (alternative and indie rock) and Stagecoach (country) were in April at the same site as Phish’s festival; Squaw Valley’s Wanderlust (alternative) is in July; and in August San Francisco’s Outside Lands Festival will take over Golden Gate Park.